A recent thought to reflect on, given in yoga class, was to consider three qualities of yoga: discipline, self-study and surrender. We were asked to consider these three qualities in our practice and in our daily lives. Did we experience them in equal amounts? And if not, did we notice any patterns in their fluctuations? As often happens with these reflections, I both wince and smirk, as if my hand were caught in the spiritual cookie jar. My inner witness no longer allows me to get away with complacent thinking. These three qualities are woefully out of whack…most of the time. Chief among them is surrender. I need more self-study like I need a hole in the head. Discipline waxes and wanes—I berate myself for its lack, and at other times I fail to recognize my discipline because I take the activity for granted. But it is in surrender that I fall short. As Eckhart Tolle points out, surrender does not mean giving up, being a door mat or never expressing your opinion. It means not resisting against what is. It’s our resistance that causes suffering, not the thing we are resisting. This all sounds rather lofty. But it’s a simple concept, profoundly difficult to apply. Some of us see surrender as loss of control. Instead, surrender is the embodiment of control (the good kind) because outside forces aren’t able to sway our thoughts and feelings. Often we stay stuck in non-surrender mode because we are righteously attached to a self-image. For example, a person with a self-image of a caretaker may have difficulty letting go of control over every element of a holiday dinner. They may well be caring, but more likely, there’s an unexamined fear going on in the background—like the loss of their over-identification as a caretaker. Who would they be without the image? A client, whose project is a rush, fails to reply to your emails. You break a leg before your tropical vacation and are forced watch others frolic. Your outdoor wedding is hampered by a downpour. Your succulent seedlings are attacked by slugs. You can’t sit down to paint or draw because you’re plagued by fears of not good enough. While resisting in these situations can result in frustration and disappointment, true surrender can elicit a sense of freedom. It may even reveal an otherwise missed opportunity. Many creative types are too attached to results and so, they don’t bother creating. This made me think of the many types of temporary art where surrender is a built-in ingredient. From Andy Goldsworthy‘s work in twigs, sand and ice, sidewalk chalk art, to sand sculptures—they all disappear because of the elements. Some temporary art is deliberately destroyed, like Burning Man sculptures, Tibetan sand mandalas and even gorgeous cakes (I tried to get permission to post a Goldsworthy photo but this is better). Though indulging in this last one doesn’t count as difficult surrender! A high-school friend and artist at heart, with little time to create, is making Daily White Board drawings and erasing the results. When I asked her what was appealing about this process, she said, “Erasing reminds me that life is fleeting… move on, enjoy the moment…” Indeed. 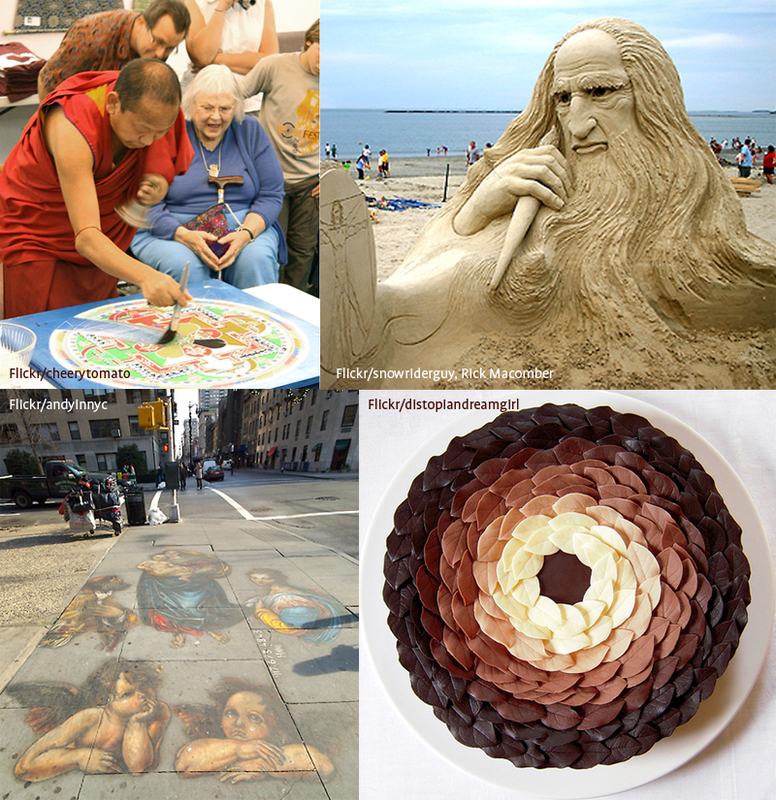 (Clockwise from upper left) Tibetan monk erasing a mandala, a DaVinci sand sculpture, a cake in homage to Andy Goldsworthy, sidewalk art in NY city.